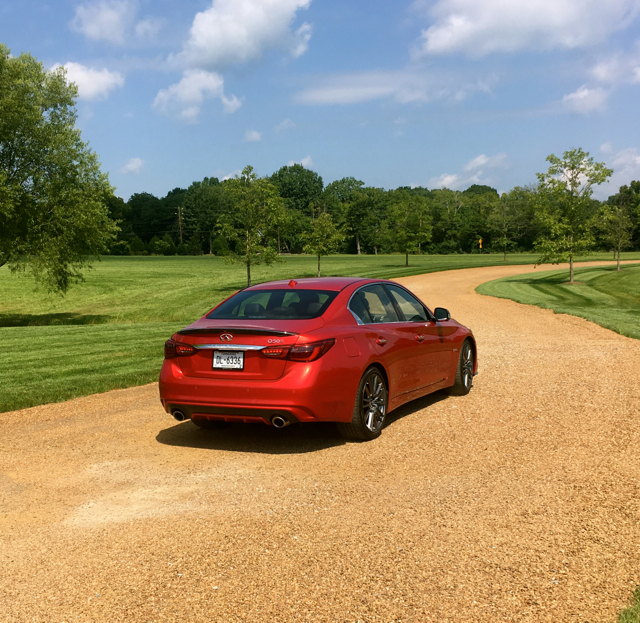 Infiniti’s entry-level sedan steps it up for 2018. 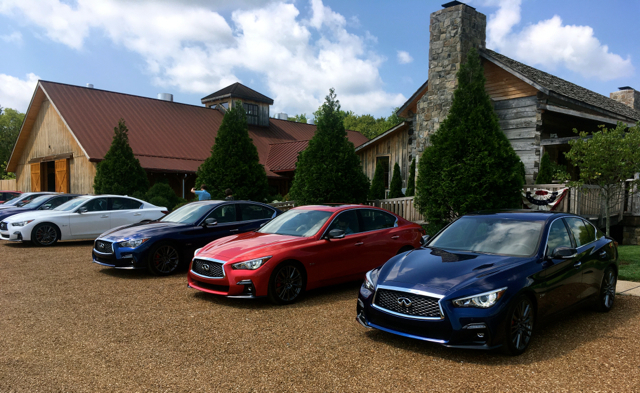 All-new 2018 Infiniti Q50 sedans parked while the drivers visit a local farm. The Infiniti Q50 is an entry-level luxury sedan, the first model to advance the company’s current naming convention, which rolled out in 2014. The sedan replaced the widely-acclaimed G Series without losing its predecessor’s top attributes — value, styling, and premium touches. Today, like all other manufacturers, Infiniti operates in a new paradigm: consumers are shifting their purchase decisions away from coupes, sedans, and wagons, and to crossover sport utility vehicles. That said, Infiniti successfully rolled out an all-new Q60 coupe last year, benefitting from sales that have surged seven-fold. Consequently, the Q60 is now the top-selling model in its class. The Q50 sedan shares the same architecture as the coupe, and is a five-passenger rear-wheel drive model available with all-wheel drive. Instead of rolling out an all-new model for its fifth year, Infiniti went the mid-product-cycle refresh route for 2018. What you have here is a reinvigorated model with a new exterior, numerous interior refinements, and four powerplant choices. Moreover, instead of giving up on its best-selling model, Infiniti is putting forth refinements it believes will continue to keep this sedan relevant in a shrinking segment. The pie may be shrinking, but Infiniti believes it’ll gain a bigger slice of it due to the update. Infiniti introduced the 2018 Q50 at an auto show earlier this year. This week, Nissan’s luxury brand pulled in automotive journalists from across the US, Canada, and Mexico to preview the sedan. Disclaimer:Infiniti paid for my flight, hotel, and served up not a few delicious meals. That said, the words herein I alone own. Downtown Nashville, Tennessee, provided the ideal place to invite journalists to drive the new Q50. 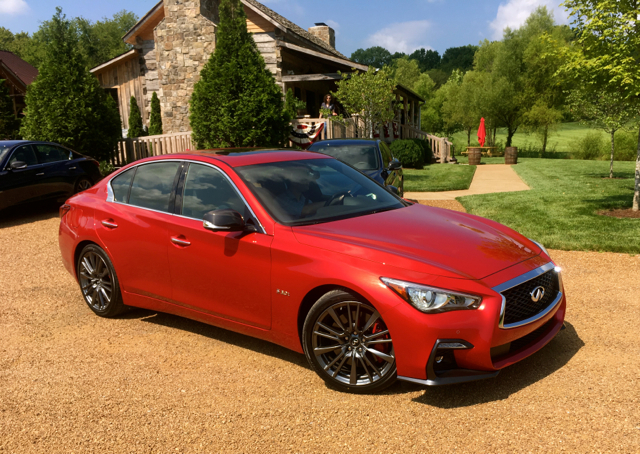 Located just 19 miles away from Infiniti’s US Corporate Office Headquarters, the hotel served as the starting point for venturing out to the middle Tennessee countryside. Four long legs of driving on twisty roads put our test models through the paces. Incidentally, only top-of-the line Red Sport 400 models were provided. Infiniti offers the 2018 Q50 in four grades: Pure ($34,200), Luxe ($36,550), Sport ($40,650), and Red Sport 400 ($51,000). Add $2,000 for all-wheel drive. The Q50 Hybrid is sold separately and retails for $50,600 ($52,600 all-wheel drive). All Pure models are powered by a 208-hp four-cylinder engine. Luxe and Sport models get a twin-turbo 3.0-liter V6 with 300 horsepower. The top-of-the-line Red Sport 400 has the same V6 engine, but doubles the intercoolers to make 400 horsepower. All three engines come paired with a seven-speed automatic transmission. All Q50 models offer a sleek design with the brand’s double-arch grille gracing the front end. A new mesh pattern and chrome surround add distinction. Updated signature lighting along with slimmer LED rear lamps round out the changes. Sport and Red Sport 400 models gain a few special touches on top of the other changes, including wider and lower intakes and a new bumper. At the rear, you’ll also find a two-tone paint scheme on the diffuser, delivering a more fetching look for the twin exhaust ports. The top-of-the-line trim also benefits from unique 19-inch wheels; new wheel designs grace other wheel sizes, including the first-ever set of available 20-inch wheels. Inside, you’ll now find imitation-leather material with twin stitching surrounding the instrument panel, special woods for the dashboard, and a new performance-oriented leather-wrapped shift knob with chrome touches. With just one powerplant offering supplied for our perusal, naturally my driving impressions are skewed toward the 400-hp V6. My test model was a rear-wheel drive Red Sport 400, a handsome sedan with firm seats up front. 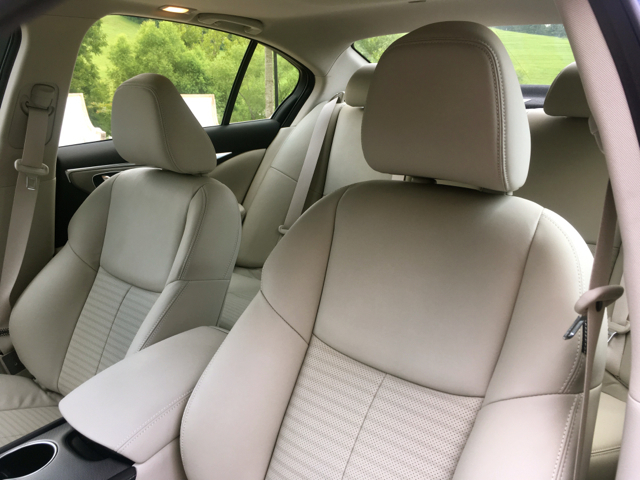 Generously bolstered, the bucket seats delivered the right amount of comfort and support as we traveled more than 150 miles on a circuitous route southwest of the city. Infiniti provides five drive modes — standard, eco, snow, sport and sport+. Throughout much of my drive time I stayed in sport+ mode, enjoying the extra weight to the steering as well as the sharper transmission shift points. Steering wheel-mounted paddle shifters are at the ready, but I stuck with the automatic shifting. Stomp the gas pedal and the twin turbos quickly spool up and deliver optimum performance. Your wheels may squeal as the sedan begins its race down the road. Shifting is incredibly smooth and ideally matched to the engine. Moreover, it is one of the most powerful engines in its class. Drive fun is best enjoyed on twisty roads and there was no shortage of them mapped out for us — the Q50 stays planted, hugging the curves as you enjoy each delicious twist and turn. The drive-by-wire steering is responsive, delivering exceptional feedback in rapid-fire succession. Yes, it is computer simulated, a fact that detractors routinely pan. For everyone else, it delivers an ideal combination of performance and handling. So, where does the Q50 fit in the overall scheme of things? Its low base price is one thing. 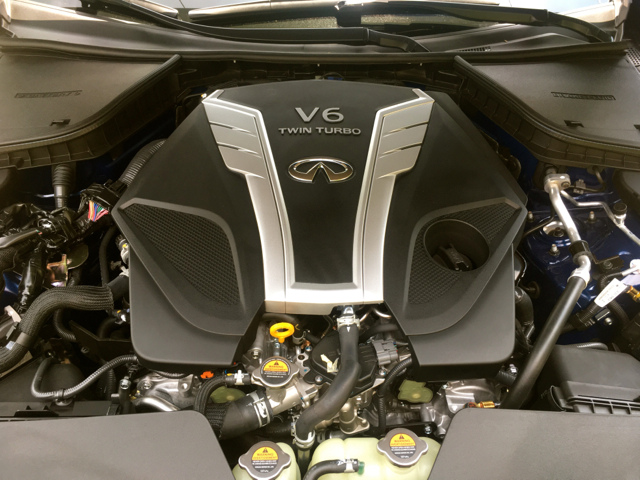 That you can get the twin-turbocharged V6 for under $40,000 supplies tremendous value. That’s a performance advantage Infiniti claims gives it a leg up on competing models from Lexus, Audi, and BMW. 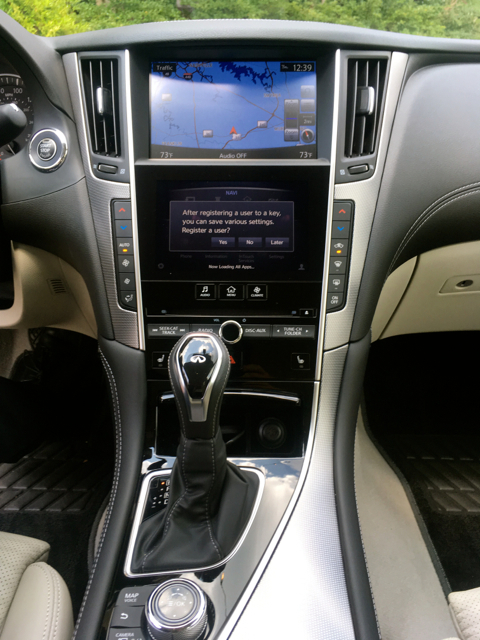 You’ll also find such available technologies as a 16-speaker Bose audio system, InTouch telematics, and a long list of available safety features, including forward emergency braking, adaptive cruise control, distance control assist, blind spot warning, lane departure warning, and lane departure prevention. 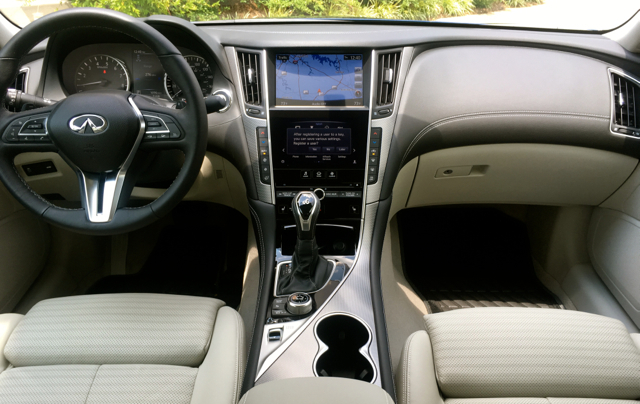 Some of these features also provide the foundation for autonomous driving, although an Infiniti representative stressed that the 2018 Q50 is all about the hands-on driving experience. My personal recommendation for shoppers is to look at the two core grades — Luxe and Sport. Choose the rear-wheel drive Luxe with the V6 engine and opt for the essential package ($2,650) bringing in navigation, heated front seats, a heated steering wheel, driver lumbar support, and a 60/40 split rear seat, and your out-the-door price is about $43,000. At this price point you could opt for the four-cylinder engine to keep your final cost below $40,000, but the performance trade-off simply isn’t worth it in my opinion.